Using Site Nav Snippet for Debut Theme In "champ-above-header"
But it doesn't seem to show up? 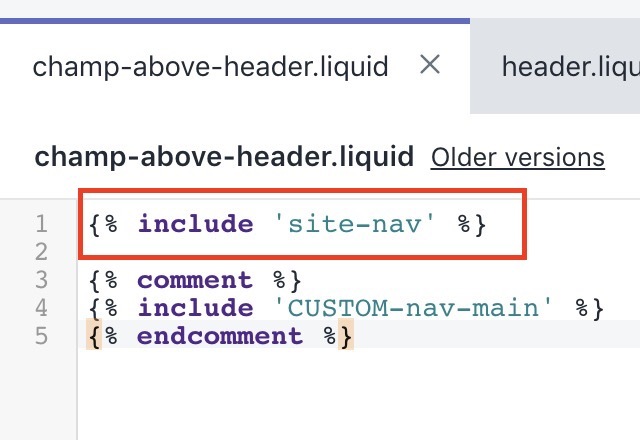 However, the same snippet does show-up on our main Shopify site (works normally, that's why we copy/pasted it into CHAMP-ABOVE-HEADER snippet) and we can also add custom navigation to the same CHAMP-ABOVE-HEADER... and those custom links work great... just not the default Debut theme nav include? Thinking we must have missed something obvious, but any help appreciated! That's interesting. It should pull it up. Could you send a team invite to support@getchamp.net and let me take a look? I'll only need access to the Theme section of your site.